Dine-Out Saturday to Benefit New Highland Park: Be sure to stop Osteria 832 (832 N. Highland) this Saturday, May 5 from 5pm to 10pm for music, giveaways, $1.50 pizza slices and beer specials! Proceeds from their anniversary celebration will benefit New Highland Park and Fire Station 19. Be sure to bring the family! Win $250 in Art! – “Like us” on the Summerfest Facebook page, and you’ll be automatically registered to win a $250 coupon that you can spend on your choice of art available at the festival! Don’t forget to volunteer (get a free Summerfest t-shirt) – spots are filling up! Please support our incredible community by donating a few hours of your time at this year’s festival. Volunteer slots are generally 2-3 hours, with many areas from which to choose – parade, 5K, artist market, kidsfest, etc. Volunteering is lots of fun, and Summerfest just won’t be the same without you. Come join in the fun and go home with the coveted volunteer t-shirt! Click the Volunteerspot link below to learn more and sign up to help. If you have any questions, contact volunteer coordinator John Becker atjnbecker@me.com. The attachment to this Report outlines the details of this fruit tree and berry bush sale. Read about the neat trees and shrubs being offered for sale and then get with your neighbors to plan plantings of those that need cross-pollination and create an orchard on your street. We will also need some early morning helpers on March 13th to bundle and label orders for customer pick-up at the new parkland. Let me know if you can help that morning – should be fun. 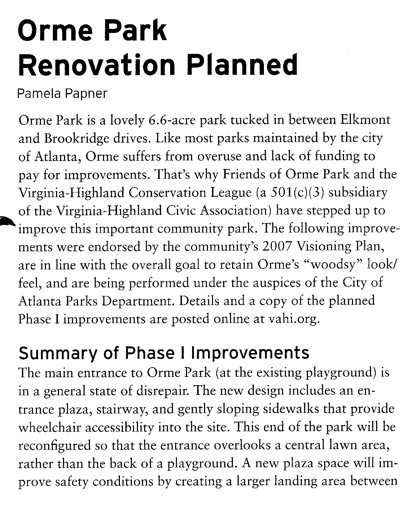 Help us increase Virginia-Highland’s green space! VHCA is concerned about quality of life in our neighborhood and Atlanta. To maintain as much green space for our residents and children, the association has pledged money to purchase the lot located at North Highland Avenue and St. Charles Avenue, and convert it into a small city park. The lot is currently on the market for $700,000. VHCA has pledged $15,000 as seed money for this project. We need your help to buy this space and keep it green! While we are looking to raise funds from foundations, corporations, the City of Atlanta and other NGO’s, we are asking neighborhood residents for contributions as well! Many thanks for your consideration and donations. We look forward to continuing to keep our neighborhood as green as possible for the benefit of our residents, their children and visitors. 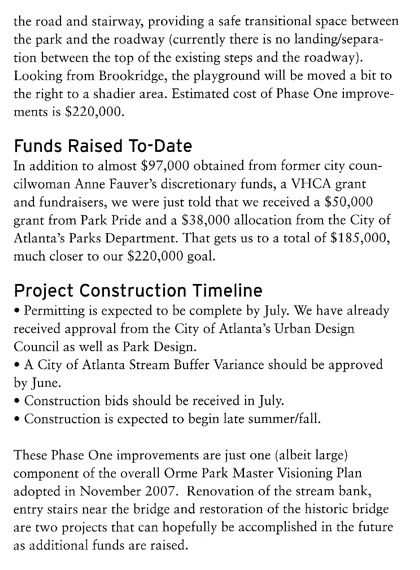 Please contact Rob Glancy, Parks Co-Chair at (404) 467-9922 ext. 100 with any questions or if you would like to volunteer your time and effort to this project. You may also contact Rob by email at parks@vahi.org.